Before I do that, I’d like to share about my journey from the land of shortage to the treasure trove of quality resources. Afterward, you will have a reference when approaching your administrator. You will also have more information about why and how I created my materials and a blueprint of how to pursue financial assistance from your school to purchase these and other time-saving and stress-reducing products. When I was a new teacher, I was amazed that world language educators were expected to teach with so few resources to accomplish our instructional goals. I had no time for a life. I spent every waking hour creating resources and lesson plans. My life would have been so much easier if I had had access to ready-made resources. Why didn’t anyone tell me how time-consuming this job was? How could I use the target language 90% of the time if students didn’t know what I was saying? How could they know what I was saying if they didn’t have the necessary visuals? How could I create the visuals and resources at the end of a long day spent with 175 students? For 31 years I worked 12-hour days creating those resources and lesson plans, always refining and improving with the latest ideas, technology, and strategies. So now you don’t have to! I discarded the ineffective activities and kept the kid-approved ones. Why re-invent the wheel and waste time with trial and error? I already did that! It’s a bad use of your time! My vocabulary and grammar PowerPoints have captivating visuals (which took forever to find and aren’t cheap) and are complete lessons in themselves. My TPR Stories and Videos with native speakers, pop-in images, and Spanish subtitles are excellent comprehensible input. My hands-on Interactive Notebook and Google Drive Activities keep students engaged. My AP Spanish Resources help students succeed on the AP Spanish Language and Culture Exam. But what if you didn’t even have to write lesson plans and could still be assured your students would be engaged and proficient? All you have to do is TEACH, correct papers and go home! Click HERE to get a FREE Adjectives Lesson Plan with bell work, interactive notebook activities, homework, student handouts, and listening activity for Spanish One. EVEN BETTER…What if you didn’t have to write lesson plans AND you could get your school to pay for the resources? Your administrator registers his / her school using an existing TpT account or by creating a new account (FREE). Your administrator invites teachers to make requests. Teachers browse, choose products and send requests to the administrator with an explanation of how the resource will benefit students and / or the department. Your administrator approves or disapproves the resource. WHAT IF MY ADMINISTRATOR SAYS NO? Tell your administrator about ACTFL, the world language authority. Tell him / her that the association recommends we use 90% target language in our classes but that is impossible to accomplish without the necessary resources. We need proper visuals in order to help students understand what we are saying. Imagine trying to understand someone who is speaking a language you don’t speak! We can’t teach, create lesson plans and still have time to create the resources. One good-quality PowerPoint with engaging visuals can take weeks, sometimes months to create! If we had a TpT resource library, everyone would have access to the same materials, which would foster collaboration. That would also be ideal for PLCs! The resources are already student-tested, and the lesson plans are created by exemplary teachers. THE CLINCHER – HUGE SAVINGS! TODOS PREPARADOS TEXTBOOK: Tell your administrator that, instead of spending $20,000 for each level of Spanish, he/she can spend $365 per teacher with a 10% discount for every additional teacher plus the cost of printing (Many resources can be provided digitally to students, particularly homework. ), a savings of about $18,000 per level. (18,000 x 4 levels = $72,000) And, if you buy more than one level at a time, you get an even greater discount, up to 15% off. Show your administrator the video below. Ask your administrator to register and get started. Learn more HERE. Click to TRY IT OUT NOW! Click HERE to see a video that explains how easy it is to use TPT for Schools. 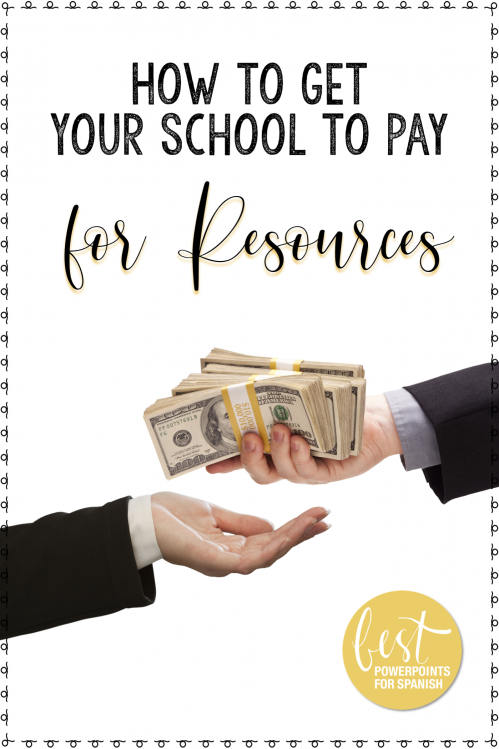 Now that you know how to get your school to pay for your resources, you can begin the fun process of browsing and making requests! If you would like to see the Facebook Live about TpT for Schools and how to incorporate videos into your lesson, with special Tpt guest, Carissa Chen, see below. In our next post we will talk about more services that help our students speak the target language outside the classroom. If you would like to get more freebies and teaching tips in your email, make sure to subscribe to my MONTHLY NEWSLETTER. Scroll down to subscribe.